At just 18km (1 hour by ferry) off the southeast coast of Attica, Kea (pop. 2,500) is the closest Cycladic island to mainland Greece. It's so close, in fact, that some people who live there commute to the Athens area for work. To get to Athens is a bit of a stretch, though- about 2 hours. Architecturally, Kea is the least Cycladic-like island. Rather than the cube-shaped, whitewashed-with-blue-trim structures that predominate throughout the Cyclades, you'll see lots of earth tones and decorative elements on Kea's buildings, and a lot of pitched, red-tile roofs rather than flat terraces. Since there are no direct connections with the Athens port of Piraeus, Kea's holiday clientele largely comprises of weekenders from Athens. But now there are easy connections along the back way, east of the mountain range dividing Attica into eastern and western sectors, which also divides Athens from the international airport. From the airport it’s an easy 45-minute drive south to the jumping off point for Kea at the port of Lavrio, which is near the southern point of Attica. There are planned improvements for the harbor at Lavrio, which may bring more tourist trade to Kea. As things stand now you can fly into Athens and be on Kea is a couple hours without having to brave the congestion in Athens. Keans seem to be a bit ambivalent about the prospect of a potential increase in tourism. They seem content on having missed out of the great tourist boom which has been taking place in the Cyclades since the 1960's. This has made Kea a worthwhile destination for those wishing to avoid the hordes of foreign tourists one usually sees in places like Mykonos, Naxos, and Santorini. Kea has a long and fascinating history. In mythology, it was thought to be the home of nymphs. The island was called Hydroussa (from the root word for water) at that time, because of its abundant springs. The gods wanted the beauties of the island for themselves, the myth goes, and sent a lion to chase the nymphs away. At that point Sirius became the ruling deity of the island. Sirius (the Dog Star), is brightest star in the night sky (8.6 light years from earth), and its appearance has been the herald of the hot, dry, summer weather. There is an archaic statue of a recumbent lion north of Ioulis, the inland capital of Kea. It's at least 2,500 years old and it is Kea's most famous site. It’s become a sort of mascot/symbol of the island. The lion wears an enigmatic smile. After the nymphs left, the island dried up. The Hydroussiotes appealed to Aristaios, semi-divine son of Apollo and the nymph Kyrini. A temple dedicated to Ikmaios Zeus, the rain god, was built, the island once again had abundant water, and the nymphs returned. These myths are thought to pre-date the Olympians. Kea has been inhabited since the Neolithic Age, according to evidence gathered from graves found throughout the northern part of the island. These graves are considered the first systematic burial in the Cyclades. There was a Bronze Age (3300-1200 BC) settlement on Kea at Agia Irini in the northwest of the island, which itself is thought to have been built over a Neolithic settlement. By 2000 BC a trade relationship between Kea and Mycenae developed. Agia Irini was demolished around 1500 BC, and Korissia, today's port, became the focus of life on the island. The Ionians settled there around 1200, and changed the island’s name to Keos. During the Archaic (700-480 BC) period, under the Ionians, Kea was divided into 4 city-states. Karthea, Korissia, and Poiessa were coastal city-states, and Ioulis was inland. The lawmaker Aristides (530-468 BC), considered one of the 7 sages of ancient Greece, was from Kea. Nicknamed “Aristides the Just,” he was a general during the Persian Wars (499-448 BC). Herodotus called him "the best and most honorable man in Athens." He authored a law entitled "Keion to Nomimon," which was practiced on Kea. In what appears to many moderns as being distinctly unjust, the law sanctioned euthanasia for anyone over 70 unable to take care of himself or be of benefit to society. They would be forced to commit suicide by drinking hemlock. The practice was banned in the 3rd century, AD, with the coming of Christianity. Kea’s trade network extended as far away as Egypt. Kea sent a contingent to the Olympic Games, and minted its own coins, which often featured the head of a dog and a likeness of Sirius on them. Kea, or Keos, stood with Athens (unlike many of the other Cycladic islands), during the Persian Wars in the early decades of the 5th century, BC, and later submitted to the leadership of Athens as part of the Delian League, which had been set up to deter further Persian incursions. She switched allegiances to Sparta, however during the Peloponnesian War (431-404 BC). During the Classical period Kea (Keos) was the home of Simonides (556-468 BC) and his nephew Bacchylides, two of the classical world's nine lyric poets. Other famous residents from that time were the 1st-genertaion Sophist (or teacher of virtue) philosopher Prodicus (465-395 BC), considered, with Protogoras, a father of linguistics, and the physician Erasistratus (304-250 BC) whose specialty was anatomy, especially of the human heart. He founded a famous school of anatomy in Alexandria, Egypt. Another Sophist, Pythokleides, was the tutor of Athens' greatest leader, Pericles. Apollo was the most prominent worshipped deity at this time, and the Keans built a famous temple to him at Karthea on the southeast coast of the island. During the Hellenistic era Kea saw a decline in her fortunes. The rise of piracy in the Mediterranean forced her to seek the protection of more powerful neighbors, and many coastal settlements moved inland. Later on, during the Christian Byzantine era, the island's name was modified from "Keos" to "Kea," and it once again prospered with the building of many churches and the stability provided by the Byzantines. In 1204 Kea fell to the Venetians of the 4th Crusade, and became the exile home of the Archbishop of Athens, Michael Choniates. After briefly being re-captured by the resurgent Byzantines in 1278, it fell again, this time for good, to the Venetians in 1296. The Venetians built a castle on the ancient acropolis of the inland town of Ioulis. It was at this time that the island was known as Tzia. The port at Tzia became a harbor for pirates, which caused the depopulation of the island, whose inhabitants fell to 200 by 1470. The island was taken over by the Ottoman Turks in 1527. The Turks re-populated the island with Albanians, but never settled there themselves. That made Tzia an ideal hiding place for anyone whom the Turks might have been looking for. The islanders were given a great deal of freedom by the Turks, and the population rose to about 3,000 by the end of the 16th century. Tzia was occupied by Russia (as well as the rest of the Cyclades) during the early 1770's, during which time the Cyclades lost a number of items of archeological significance to the Russians. Tzia suffered extensive damage during the Russo-Turkish War of 1787-1792, when the islanders, who had sided with Russia, were massacred by the Turks. Kea was one of the first islands to revolt when the Greek war of independence broke out is 1821. It became part of the Greek state in 1830. In the 20th century life steadily improved on Kea, as the island exported agricultural products, and a now-abandoned enamel and metal works factory was built. Many Keans emigrated to the US during the 20th century, and then some of their descendants returned. Then, in the 1970’s artist Alekos Fasianos moved to Kea. This influenced other artists to settle on Kea. Kea is now home to a thriving arts community, helped by its proximity to Athens. Korissia (or, as the locals call it, Livadi), population 600, is Kea’s port. It sits on the northwest corner of the Kea, nestled safely inside the most protected bay on the island. The first sign that you are not in a typical port in the Cyclades is its small size. It's really not much of a big ship port- there are berths for only a couple large ferries. The second sign is that, disembarking, you are not besieged by the "domatia kamakis-" crowds of mostly young men waving hotel pamphlets in your face, trying to get you to rent at the place they're working for. Instead you get relatively well to do Athenians disembarking, coming to their weekend homes, or renting a place for a quick getaway. The shops, for the most part, dispense with the "touristika skoupidia-" tourist junk (like t-shirts with silk screened, sexual images and suggestive phrases, statues of satyrs ready to get it on, and other Greek-themed figurines mass produced in China). Instead, you'll find stuff you can actually use- snorkeling tubes and masks, board games, sarongs to cover up after swimming, beach toys, and assortments of tanning creams and oils. Korissia has a long, nice, sandy beach with very clean water, and a few supermarkets, along with a small assortment of restaurants, cafes and bars, in addition to a couple nice hotels. On Agia Triada hill behind town, the remains of an ancient temple to Apollo can be found. The "Kea Kouros" was found here in 1930. This iconic, bigger than life-sized figure dated about 525 BC now lives in the Athens Archeological Museum. It is one of only 12 intact kouroi in the world, and one of the best preserved. The road leading inland from Korissia follows a valley, a fold between bare hills heading for the capital of the island, Ioulis, 5.5km inland. Just outside of town are the ruins of the enamel factory that kept 900 people employed during the 1930’s Depression, its smokestack rising as high as a minaret missing its prayer platform. Jus to the left along the road is a little open-air factory museum. The larger bay which shelters Korissia is subdivided into 3 stubby fingers. Korissia is on the left finger, on the southwest. Heading northeast, the middle, much smaller finger is home to Gialistraki Beach, about 600 meters from Korissia's harbor beach. Vourkari sits on the shore of the final finger, at the northeast- or right- end of the larger bay. This is where visiting yachts drop their anchors because it’s probably the most sheltered place on Kea. This part of the bay features water that is almost always smooth as glass. Vourkari is the epicenter of Kea’s nightlife, with so many clubs and bars that you’ll start feeling like you’re in one of the more touristy Cycladic islands. The only difference, and it’s a big one, is that most of the patrons are Greeks, usually from Athens. The clubs go full throttle during the months of July and August. Otherwise they’re pretty quiet. About 350m directly across the water from Vourkari is a place called Agia Irini, where the ruins of a temple to Dionysus, god of wine can be found. There are also walls, and a tower and gate ruins dating from the Bronze Age. Other ruins at Agia Irini include a fenced off area enclosing Minoan, Mycenaean, and Hellenistic era ruins. Despite the fencing, which allows ongoing excavations to go on uninterrupted, you can still get a good look at things. The Kokka peninsula, at the northeast end of the bay, is a narrow neck of land. Its thinnest point, called Katsonis Crossing, is only 30m wide. That's where Greek ship captain Lambros Kotsonis, trapped in the harbor by the Turkish navy, had his men drag their ship up and over the peninsula during the previously mentioned 1787-92 Russo-Turkish War. Ioulida, or Hora (pop. 350), as the locals call it (just about all locals in all Cyclades, and other Greek islands, call their capital towns “Hora,” no matter what the official name is), is about 5km up the valley road from the port. It’s a hilltop village, and the hills (there are 2 of them) are steep, meaning the houses are almost stacked on top of each other as they climb the grade. You can’t drive in Ioulida, and couldn’t even if cars were permitted, because the lanes are so narrow. The town is essentially a citadel, a walled fortress on high ground providing ample protection from invaders. Cars get parked at a large plaza outside the town. Heavier items get transported around the village on the backs of donkeys. This includes building materials for the ever-ongoing remodeling of its dwellings. Just inside the entrance to Ioulida, on the left, you come to the Kastro, which is the oldest part of a town that was built for protection against marauders, usually pirates, coming in from the sea. There are the remnants of an ancient fortress, and of Venetian-era fortifications. Below the Kastro is the cave-church of Agia Paraskevi. Ioulida is also home to the Kea Archeological Museum, housing much of the trove of finds (minus the Kouros) that have been unearthed in Kea, starting with the Neolithic Age up to and beyond the time of Christ. The main square of town is the center of life in Ioulida. With the town rising around it like an amphitheatre, it is a cool refuge during the evenings after the searing summer days, and many people from the coastal areas head up there to catch the refreshing evening breezes. Any festival of note on Kea is held here, including wedding receptions, baptismal celebrations, religious holidays such as the massive celebration of the Assumption of the Virgin on August 15th. Musical performances here carry throughout the village because of the unusual acoustics the surrounding buildings give to the square. Ioulida changed when famous artist Alekos Fasianos made it his home in the 1970’s. This started a flood of artists making Kea either their summer or their permanent home. There is a thriving arts community on the island now, and many artists make their homes in Ioulida. A number of them offer summer instruction programs. Rich Athenians began to remodel houses in Ioulida (new construction in the village is prohibited) or build new ones elsewhere on the island. Ioulida has thousands of steps because of the constant changes in elevation. Ioulida’s rectangular and square buildings are so packed together that the village has been compared to a pueblo village. Its warren of streets and alleys are great places to get lost in. It’s a beautiful, relatively unspoiled town. The influx of wealthy Athenians and artists have given the village a much more cosmopolitan atmosphere. There are also several springs in the area around Ioulida, providing pure water that has percolated down through the strata of limestone from abundant winter rains. We've already had a look at Korissia, Vourkari, and Ioulida. Here are some more villages. 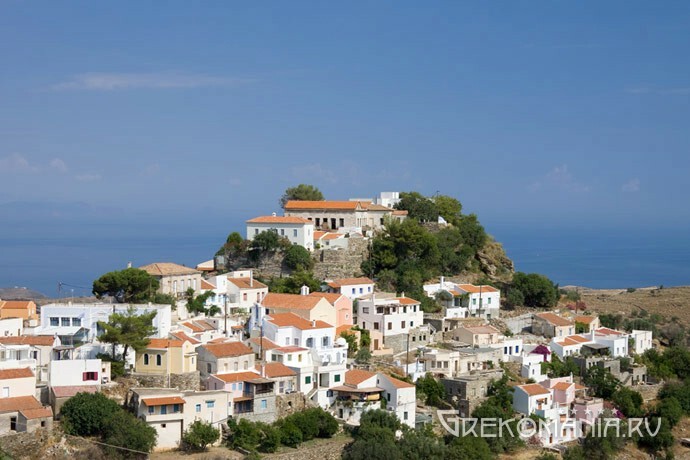 Pisses is on the west coast of Kea, about 11km south of Korissia and at the west end of a fertile valley. The valley is really beautiful, featuring well-tended farmsteads, almond orchards, abundant flowers in the spring, and cypress and eucalyptus trees. There are some nice places to eat in Pisses, and the beach is outstanding. What Pisses is best-known for, however, is the ruins of the ancient port of Piessa. This includes ruins of dwellings, and of the ancient temple to Apollo, upon which was later built the church of Agia Sotiria. Pisses is also home to the only organized campground on Kea. Koundouros is a coastal tourist town on the southwest coast of Kea, about 15km away from Korissia and 2.5km south of Pisses. Its hilly skyline is punctuated by some scenic windmills, which are actually bungalows. It has a series of at least 6 very nice, small, sandy beaches in small coves, most of which are well-organized. The first beach tends to be quite crowded, and you have to navigate past parked cars on the side of the road to get to the less crowded beaches. They all have some of the bluest water in the Aegean. Koundouros a place to play games- mini golf, basketball, and lots of water sports. There are a number of fine hotels, and some resorts. There's some fun night life here, too. There are also a number of expensive homes in the immediate area. Otzias, on the north coast, 10km north of Ioulida, is a quiet hamlet on the sea and home to only about 80 people. It's a great place to get away for some peace and quiet, and its beach is quiet, safe, and family-oriented. Otzias features some really nice hiking paths. There are some ruins of an ancient port at Otzias. Spathi, on the northeast coast of Kea, and about 7km around the bend of the top of the island from Otzias, has one of the nicest beaches on Kea. The name comes from the word for "Sword." Spathi is a good place for snorkeling, and spear fishing. Near Spathi is the monastery of Panagia Kastriani, the most important on Kea. Dating from the 18th century, it is the home of an icon of the Virgin Mary which became the patroness of the island. Sitting on an eminence, on a shelf of rock, the monastery gives you great views of Kea, the surrounding Aegean, and the nearby islands. Because of the large numbers of artists on Kea, there is a thriving arts tourism industry, mostly centered in Ioulida, where you can combine a vacation with instruction in various painting techniques. Kea is a well-known for its hiking paths. Its network of cultural interest routes includes ancient paved roads and access paths to various villages and settlements. They lead to beaches, ancient temples, beaches, and other places of interest such as the Kea Lion. Routes are numbered, with decent signage. Especially nice is route #1, from Ioulida to the Kea Lion, and on to the beach at Otzias, where a dip in the sea gives you a perfect ending to the 7-kilometer trek. Ancient Karthea, on the southeast coast and about 6km from the island's southern tip, is where the city once stood which was founded in 1200 BC. What's nice about it is that is completely unspoiled because the only way to get to it is either by walking, or by boat. It's a slightly more than 2km downhill walk from the closest road at Stavroudaki, which is about an hour's walk, and considerably longer on the uphill return trip. You need to bring your own provisions, and especially plenty of water. The site, which includes the foundation of a temple to Apollo, a temple to Athena, an ancient theatre, and various defensive fortifications, is well worth the effort. The bonus is the beautiful beach downhill from the site, and its exceptionally clear waters. If you make a day of it, walking down in the cool of the morning, then spend time at the beach after visiting the ruins, you can walk back when temps drop in the late afternoon. The Wreck of the Britannic. The Britannic, anchored just outside the harbor at Korrisia as a hospital ship for the British Gallipoli Campaign in the Dardanelles during WWI, was a larger, sister ship of the Titanic. Commissioned 6 months before the start of WWI, and 3 years after the Titanic went down, it was the largest ship ever built. On November 21, 1916, having dropped anchor at Kea on her way northwest to Gallipoli, she exploded and, in less than an hour, went down in 120m of water. It's still the largest sunken ocean liner in the world. Nobody is certain what happened. However, the ship's log which was kept on a German submarine in those waters mentioned seeing and not attacking a hospital ship, but also mentioned that it had already laid mines in the waters nearby. The ship had been built with the Titanic in mind, with an improved bulkhead system. But the explosion (or explosions) were so devastating the ship had no chance. Oceanographer Jacques Cousteau theorized that the initial explosion set off a much larger second explosion when the highly volatile coal dust inside the hold ignited. In a supreme irony, a stewardess named Violet Jessup, who had survived the May 11, 1911 sinking of the Titanic, was also on board the Britannic. Only 30 out of 1036 passengers were lost. The ship had been on its way to pick up Gallipoli casualties, and the death toll would have been much higher had the ship been full of wounded and disabled men. Fishermen from the island rescued many of the casualties, and of course the waters of the Aegean were much warmer than those of the North Atlantic when the Titanic went down. Cousteau made a thorough exploration of the wreck in the 1970's. Diving the wreck is very difficult because of the great depth (recreational scuba divers can only go 40m deep). Cousteau used deep sea scuba divers, but had to use an SDC (Submersible Decompression Chamber) as well. Thus Kea. A terrific place to visit, with much to see, do, and learn about, all within a couple hours of Athens.